Hello everyone! 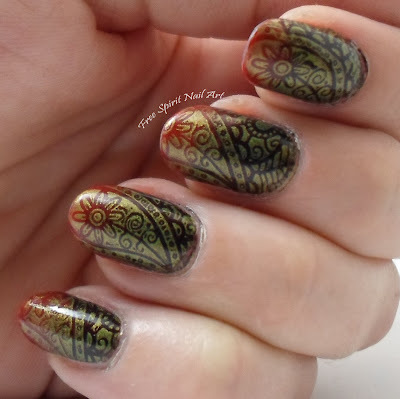 I have a basic stamping mani done with complementary colors to share with you today. I used Sinful Colors new neon shade called Rays of Bright. 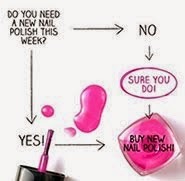 It really doesn't look like a neon color to me even with a top coat of Seche Vite (it does dry matte/satiny). I like it, it's just not what I'd consider a neon. I used Sally Hansen Blue Me Away for the stamping with Pueen plate # SE02B. The accent nail is done with Zoya's Vega from their Pixie Dust line. I don't think I actually like this mani but it wasn't horrible. I'm really looking forward to all the new fall colors so I might retry this with some new polishes later. As always please share it if you like and check back soon!